Definition: An instrument in which zero or null indication determines the magnitude of measured quantity such type of instrument is called a null type instrument. It uses a null detector which indicating the null condition when the measured quantity and the opposite quantity are same. Such type of instrument has high accuracy and also it is very sensitive. For the operation of the null type instrument, the following condition requires. The effect produced by the measuring quantity. The opposing effects whose value are accurately known. It is necessary for measuring for determining the numerical value of the measured quantity accurately. A detector which detects the null conditions, i.e., a detector is a device which indicates zero deflection when the balance condition occurs. Consider a null point instruments (i.e., the DC potentiometer) wherein an unknown emf Ex is measured. The slide wire of the potentiometer has been measured regarding emf with the help of standard emf source. 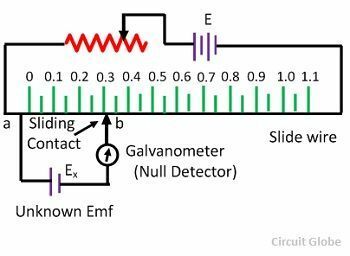 The null detector is a current galvanometer whose deflection is proportional to the unbalance emf, i.e., is that the difference between the emf Eab across portion ab of slide wire and the unknown emf Ex. As soon as both are equal. Therefore the unknown emf Ex is equal to Eab which is directly indicated by the measured scale places along the slide wire. The following are the advantages of the null type instruments. The accuracy of the null type instrument is high. This is because the opposing effect is measured with the help of the standards which have a high degree of accuracy. The null type instrument is highly sensitive. In null type instrument, the balanced quantity is measured out. The detector has to cover a small range around the balanced point and hence it is highly sensitive. Also in null type instrument, the detector need not be measured it has only to detect the presence and direction of unbalance and not the magnitude of unbalance. Note: Null type instrument requires many controls before null condition are obtained and hence it is not suitable for dynamic measurement. Because in dynamic measurement the quantity changes rapidly with the time.